Our three models allow residents to move into a space that fits their budget and space requirements. Having a home should not come with strain – we want each resident to feel comfortable and safe. With approximately 220 sq. ft., this housing option allows for 1 individual to live comfortably. With approximately 290 sq. ft., this housing option allows for up to 2 individuals to live comfortably. With approximately 410 sq. 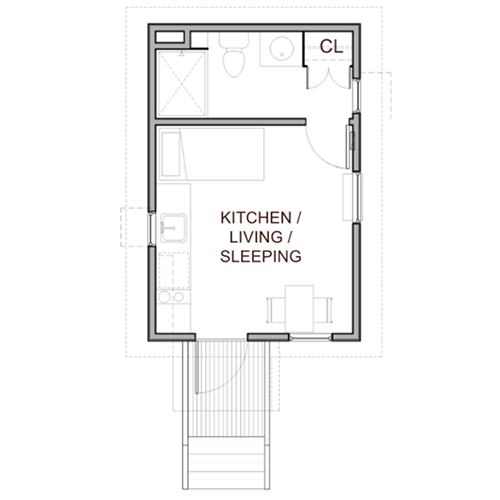 ft., this 2-story housing option allows for up to 3 individuals to live comfortably. We know choosing a home is just one part of the move-in process. Safety comes next. We are proud to say we have a dedicated team of safety specialists monitoring the grounds daily.